1. Why does a compass needle get deflected when brought near a bar magnet? The needle of a compass is a small magnet. That’s why when a compass needle is brought near a bar magnet, its magnetic field lines interact with that of the bar magnet. Hence, a compass needle gets deflected. 1. Draw magnetic field lines around a bar magnet. 2. List the properties of magnetic lines of force. → Magnetic field lines emerge from the north pole. → They merge at the south pole. → The direction of field lines inside the magnet is from the south pole to the north pole. → Magnetic lines do not intersect with each other. 3. Why don't two magnetic lines of force intersect each other? The two magnetic field lines do not intersect each other because if they do it means at the point of intersect the compass needle is showing two different directions which is not possible. 1. 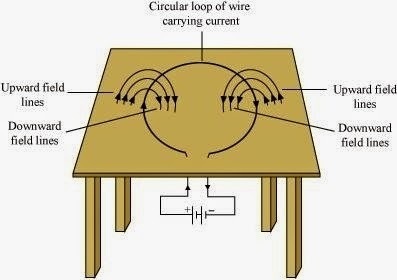 Consider a circular loop of wire lying in the plane of the table. Let the current pass through the loop clockwise. Apply the right-hand rule to find out the direction of the magnetic field inside and outside the loop. 2. The magnetic field in a given region is uniform. Draw a diagram to represent it. 2. In Activity 13.7 (page: 230), how do we think the displacement of rod AB will be affected if (i) current in rod AB is increased: (ii) a stronger horse-shoe magnet is used: and (iii) length of the rod AB is increased? (i) If the current in the rod is increased then rod will be deflected with greater force. (ii) If a stronger horse-shoe magnet is used then also rod will be deflected with greater force due to the increase in magnetic field. (iii) If the length of the rod AB is increased. 1. State Fleming's left-hand rule. Fleming's left hand rule states that if we arrange the thumb, the centre finger, and the forefinger of the left hand at right angles to each other, then the thumb points towards the direction of the magnetic force, the centre finger gives the direction of current, and the forefinger points in the direction of magnetic field. 2. What is the principle of an electric motor? The principle of an electric motor is based on the magnetic effect of electric current. A current-carrying loop experiences a force and rotates when placed in a magnetic field. The direction of rotation of the loop is according to the Fleming’s left-hand rule. 3. What is the role of the split ring in an electric motor? The split ring in the electric motor also known as a commutator reverses the direction of current flowing through the coil after every half rotation of the coil. Due to this the coil continues to rotate in the same direction. 1. Explain different ways to induce current in a coil. → If a coil is moved rapidly between the two poles of a horse-shoe magnet, then an electric current is induced in the coil. 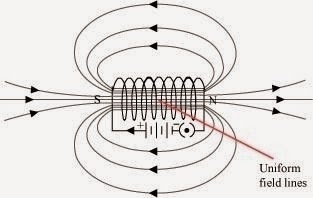 → If a magnet is moved relative to a coil, then an electric current is induced in the coil. 1. State the principle of an electric generator. Electric generator works on the principle of electromagnetic induction. Electricity is generated by rotating a coil inside magnetic field. 2. Name some sources of direct current. 3. Which sources produce alternating current? 4. Choose the correct option. 1. Name two safety measures commonly used in electric circuits and appliances. → Electric Fuse: An electric fuse is connected in series it protects the circuit from overloading and prevents it from short circuiting. → Proper earthing of all electric circuit in which any leakage of current in an electric appliance is transferred to the ground and people using the appliance do not get the shock. 2. An electric oven of 2 kW is operated in a domestic electric circuit (220 V) that has a current rating of 5 A. What result do you expect? Explain. 3. What precaution should be taken to avoid the overloading of domestic electric circuits? → Too many appliances should not be connected to a single socket. → Too many appliances should not be used at the same time. → Faulty appliances should not be connected in the circuit. → Fuse should be connected in the circuit. 1. Which of the following correctly describes the magnetic field near a long straight wire? ► (d) AC generator has slip rings while the DC generator has a commutator. 6. State whether the following statements are true or false. 7. List three sources of magnetic fields. 8. How does a solenoid behave like a magnet? Can you determine the north and south poles of a current-carrying solenoid with the help of a bar magnet? Explain. 9. When is the force experienced by a current-carrying conductor placed in a magnetic field largest? 10. Imagine that you are sitting in a chamber with your back to one wall. An electron beam, moving horizontally from back wall towards the front wall, is deflected by a strong magnetic field to your right side. What is the direction of magnetic field? The direction of the magnetic field is vertically downwards. The direction of current is from the front wall to the back wall because negatively charged electrons are moving from back wall to the front wall. The direction of magnetic force is rightward. Hence, using Fleming's left hand rule, it can be concluded that the direction of magnetic field inside the chamber is downward. 11. Draw a labelled diagram of an electric motor. Explain its principle and working. What is the function of a split ring in an electric motor? Principle: It works on the principle of the magnetic effect of current. A current-carrying coil rotates in a magnetic field. Working: When a current is allowed to flow through the coil MNST by closing the switch, the coil starts rotating anti-clockwise. This happens because a downward force acts on length MN and at the same time, an upward force acts on length ST. As a result, the coil rotates anti-clockwise. Current in the length MN flows from M to N and the magnetic field acts from left to right, normal to length MN. Therefore, according to Fleming's left hand rule, a downward force acts on the length MN. Similarly, current in the length ST flows from S to T and the magnetic field acts from left to right, normal to the flow of current. Therefore, an upward force acts on the length ST. These two forces cause the coil to rotate anti-clockwise. The current flows through the coil in the direction TSNM. The reversal of current through the coil MNST repeats after each half rotation. As a result, the coil rotates unidirectional. The split rings help to reverse the direction of current in the circuit. These are called the commutator. 12. Name some devices in which electric motors are used? Some devices in which electric motors are Water pumps, Electric fans, Electric mixers and Washing machines. 13. A coil of insulated copper wire is connected to a galvanometer. What will happen if a bar magnet is (i) pushed into the coil, (ii) withdrawn from inside the coil, (iii) held stationary inside the coil? (i) The needle of the galvanometer shows a momentary deflection in a particular direction. (ii) The needle of the galvanometer shows a momentarily in the opposite direction. (iii) The needle of the galvanometer shows no deflection. 14. Two circular coils A and B are placed closed to each other. If the current in the coil A is changed, will some current be induced in the coil B? Give reason. 15. State the rule to determine the direction of a (i) magnetic field produced around a straight conductor-carrying current, (ii) force experienced by a current-carrying straight conductor placed in a magnetic field which is perpendicular to it, and (iii) current induced in a coil due to its rotation in a magnetic field. 16. Explain the underlying principle and working of an electric generator by drawing a labelled diagram. What is the function of brushes? Principle: An electric generator works on the principle of electromagnetic induction phenomenon. According to it, whenever a coil is rotated between the poles of a magnet, an induced current is set up in the coil, whose direction is given by Fleming’s right hand rule. Working: Let in the beginning, as shown in Fig. brushes B1 and B2 are kept pressed separately on rings R1 and R2 respectively. Let the axle attached to the rings is rotated such that arm AB of the coil moves up and arm CD moves down in the magnetic field. Due to rotation of arms AB and CD induced currents are set up in them. As per Fleming’s right hand rule induced currents in these arms are along the directions AB and CD. Thus an induced current flows along ABCD and current in the external circuit flows from B2 to B1. After half a rotation, arm AB starts moving down and the arm CD upward. Therefore, directions of induced currents in these arms change. Thus net induced current now becomes in the direction DCBA. In the external circuit now current flows from B1 to B2. Thus after every half rotation current changes its direction and an alternating current is obtained from the generator. Function of Brushes: Brushes are kept pressed on the two slip rings separately. Outer ends of the brushes are connected to the galvanometer (or the external load). Thus brushes help in transferring current from the coil ABCD to the external circuit. 17. When does an electric short circuit occur? If the insulation of the wires used in the circuit is damaged or the appliance used is faulty due to which the live wire and the neutral wire comes in direct contact as a result current in the circuit rises and the short circuit occurs. 18. What is the function of an earth wire? Why is it necessary to earth metallic appliances?